These amazingly colorful transition tails make the perfect addition to any kite. Add them to your multi-line kite and you will be "skywriting" like a professional daredevil stunt pilot in the blink of an eye. Add them to your fancy show kite or even a basic single-line family kite and your friends will call you the "Sky Decorator" of the ages. Even a modest single-line kite like one of our 6.5’ deltas, will easily handle as many as six or more of these tails for an amazing sky show. Add two, for or even six of them to you dual-liner and the sky writing fun will blow you mind. Six of these linked together would be an amazing 150 feet! The good news about these tails is that they are modular and can be linked together making for longer and longer tails... The bad news is that they are addictive! Start with just one, and let the addiction begin. Some kite fliers have more tails than kites! Durable Colorfast Nylon will last for years and years. First popularized in North America by our friend and master kite builder Kevin Shannon, these Transition Tails are easily our favorite kite flying accessories. You will be able to use them on any kite you ever own. 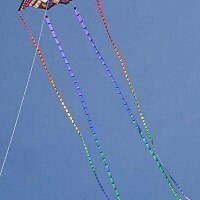 Our Premier 5.0 Parafoil is one of our best sellers year in and year out.Though a small tail is included, this one is sporting three 50' Transitions Tails attached to the kites line. Click the button below to add the Transition Tail, 25', Rainbow to your wish list.